Priority Pass, a membership program that gives travelers access to independent lounges at airports around the world, is celebrating 25 years of providing a quiet place to relax or work regardless of your class of ticket or frequent-flyer status. The company continues to grow its locations—last year it surpassed 1,000 lounges—and expand its offerings. Its latest amenities include spa treatments at the Club Aspire in London’s Heathrow Airport and dining at seven restaurants throughout the Sydney Kingsford Smith Airport. Choose from three memberships to have discounted or unlimited free access to the lounges, where food, drink and Wi-Fi are complimentary. Breakfast at Tiffany’s is not just a movie anymore. The Tiffany & Co. flagship store in New York City has re-opened the renovated fourth floor, where you will find its new home and accessories collection and The Tiffany Blue Box Café. On the menu for breakfast are truffled eggs, a smoked salmon bagel and avocado toast, which you can enjoy for just $29. It’s a smart-looking space with herringbone marble and Tiffany blue walls and furnishings. Among the artful objects you can shop for after breakfast are a bone china tea service and leather accessories in a Tiffany Blue blocking pattern. The design hotel scene is heating up in Scandinavia. 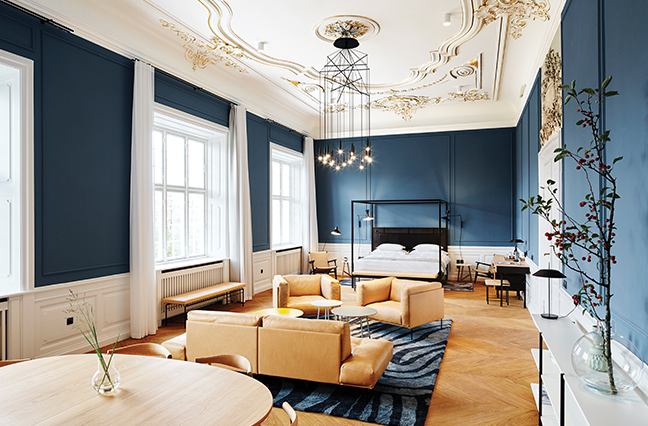 In Copenhagen, the new Nobis Hotel opened in a historic building that once served as the Royal Danish Conservatory of Music. The building’s elaborate detailing is the backdrop for the neoclassicist interiors. 77 rooms are painted in green-blue tones and have wooden parquet floors, high, white-painted windows with crossbars, and bathrooms with gray Italian marble. Located next to Tivoli Gardens and near the fashionable Vesterbro neighborhood, it’s close to both the city center and hip shops and cafés. In Helsinki, the Hotel St. George is slated to debut in spring 2018. A former 1840s printing house, the hotel will have 148 rooms and five suites, a wine room and a winter garden.